In the world of baby and children's footwear there are only a handful of companies that go above and beyond minimum requirements and go out of their way to make sure the shoes they make are safe and non-toxic. Among these is Little Soles, a children's footwear company based in Canada. They have generously shared their top quality shoes with Eco-Babyz. We received the Couture Sandal which is a great summer pair for little girls. Quality & Value: Little Soles are designed to last and to withstand any wear and tear a toddler can throw at them. I am sure that my daughter will not be the only one wearing this pair, they can be passed on to siblings, cousins, and friends. You can buy a reasonably priced pair for as low as $19.99 and most regular prices range from $24.99 for baby shoes to $49.95 for older children's shoes. The clearance section is a great place to find good deals and they have a newsletter that will keep you in the loop. How is this green: Little Soles shoes go through extensive testing for lead, arsenic, cadmium, antimony, barium, mercury, and selenium. You can rest assured that the shoes your baby is wearing are not toxic and will not cause harm. 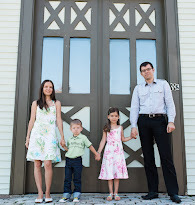 Moreover, Little Soles is and environmentally and socially responsible company. You can always stop by their website to find out more. Company: There are many companies that put profits ahead of consumer health and safety. But if more companies would be like Little Soles, parents would not have to look to legislation to provide that safety. The updated CPSIA (Consumer Product Safety Improvement Act) merely enforces a lead reduction, but does not ban it in children's products. It doesn't even contain regulations for other toxins, Little Soles takes on the responsibility for the safety of their products and is voluntarily testing their shoes - something I wish more companies would do. Little Soles is a role model for other children's products manufacturers and an inspiration to small companies and entrepreneurs! Did I mention I love their user friendly website? The shoe tree is really cute! 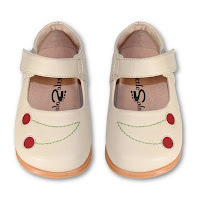 One Eco-Babyz reader will win their choice of a pair of Little Soles shoes! MANDATORY ENTRY: Visit the Little Soles website and let us know which pair of shoes and in what size you would pick if you win. Contest ends at 11:59 pm EST on Thursday, June 10th 2010. The winners will be selected using Random.org on Friday June 11th and notified by email (make sure I have a way to get in touch with you, provide your email in the comment if it is not in your Blogger profile). Open to 18+ US and Canada residents only! Thank you! SQ1333 - "Euro Sport" Runner Brown & Powder Blue would be adorable in a size 7, I think that all of the shoes are adorable. I subscribed to the newsletter for Little Soles( choochoo1717@hotmail.com). Great line of shoes - so sweet. I couldn't find a sizing chart so I'm going to guess that my girl is size 11 and I would choose the Little Soles Children's Shoes - Black and White #1121 if I won. Thanks for the chance. I like the "Old School Loafer"
LOVE THIS COMPANY!! my gosh i didn't even know shoes have all these chemicals! I would pick the pink with cream crib shoes (#707) in a 0. I like the 1128 - Little Soles Classic Infants Shoes - Pink Sandal in size 7. 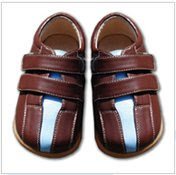 I like the Little Soles Classic Infants Shoes - Chocolate Brown with Flower in size 8. 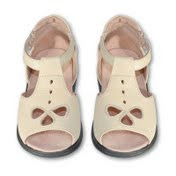 I'd love to get the beautifully retro mary janes in a size 6, please! I love the Beautifully Retro Mary Jane. I would probably get it in a 7. I would love the SQ1329 - “Bloom” Mary Jane shoes in size 7!! To cute!! I would choose the 659 - Baby Soles - Pink Metro Jane with Petals in size 0. I would love teh Simply Mary Janes in a size 8 for my girlie. THey are so cute! I would choose “Simply” Mary Jane squeaky shoes in size 5, so cute!! I'd pick euro sports runner in brown & powdered blue in size 7! i'm a new blog follower- just found your blog and love it!! !